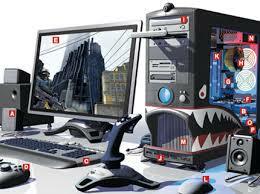 A gaming PC is a computer that comes equipped with powerful capabilities, fast processing capabilities and a large amount of memory. is that they are specifically designed and built to support the demanding computing requirement by gaming software application. All gaming PC’s will require a high-end GPU to support the detail 3D graphics and realistic imagery with a number of application options, message boards, and file sharing via online portals, such as steam and origin. starCraft II : Heart of the Swarm. A high end video/ specialized a GPU unit. A high definition sound card. High –end cooling such as water cooling system. Maximum RAM that is supported by the motherboard. Fast internet connection for interactive gaming needs. Real-time video and audio input/output capabilities. In some cases , HDMI output. To make your gaming experience excellent to an extent you need some more plug ins. There are many different peripherals used within the gaming world. The most common pones include the mouse and the keyboard. Gaming mice that are wireless and include many buttons and difference ergonomic factors. Customized keypads, with movable key. Steering wheels used for auto racing games. This post is specially dedicated to game lovers all around the world. This post is just about simple guide on how to chose a gaming PC.